Texas Senator Ted Cruz has yet to make a presidential endorsement, but he endorsed Marco Rubio’s re-election on June 22 for Florida senator. “Marco Rubio [is] a friend and has been an ally in many battles we have fought together in the Senate. I’m glad to support him in his bid for re-election,” Cruz tweeted. 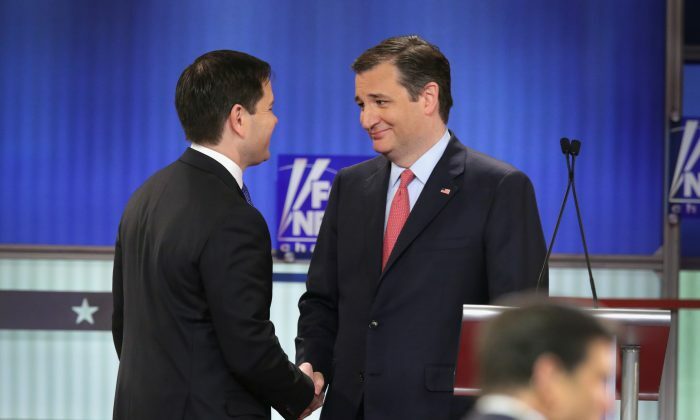 In the presidential primary season, Rubio and Cruz—both first term senators of Cuban descent—were fierce rivals, sparring over immigration reform during the Republican debates. The rivalry lead to a dramatic moment during the CBS Republican debate in February this year, when Rubio accused Cruz of not knowing how to speak Spanish, and Cruz responded to Rubio in fluent Spanish. Rubio dropped out of the Republican primaries after losing to Trump in the Florida primary on March 15. An early favorite in the primary season, Rubio only won one state, Minnesota. Cruz dropped out of the race after losing the Indiana primary to Trump on May 3. Rubio’s decision to run in the Florida senate race is a reversal of an earlier pledge to forego reelection. In a lengthy statement Rubio laid out the reason for his change of heart, framing it as a possible determining seat in the Senate for the Republicans to maintain a majority. “Control of the Senate may very well come down to the race in Florida. That means the future of the Supreme Court will be determined by the Florida Senate seat,” he said in the statement. Rubio has to win the Aug. 30 primary and faces contention from two wealthy first-time candidates, businessman Todd Wilcox and developer Carlos Beruff. If he wins the primary, he will then face Democratic preferred candidate Rep. Patrick Murphy or liberal firebrand Rep. Alan Grayson in November.